Multiple sclerosis has a tendency to really, really annoy you. For people who don’t have this disease, this is a difficult concept to fully grasp. The best way I can put it: combine Jar Jar Binks, a shoe freshly stepped in dog doo-doo, Nickelback, reality TV shows, impenetrable battery packaging, potholes, the last episode of Dexter, and trying to find the start of cellophane. That kind of annoying, times, well, a billion. And one of MS’s prime annoyances is its proclivity to steal away passions you enjoy. I used to be a bike rider, until balance issues knocked me literally off the saddle. So last year I swiped back that passion, purchasing a trike. 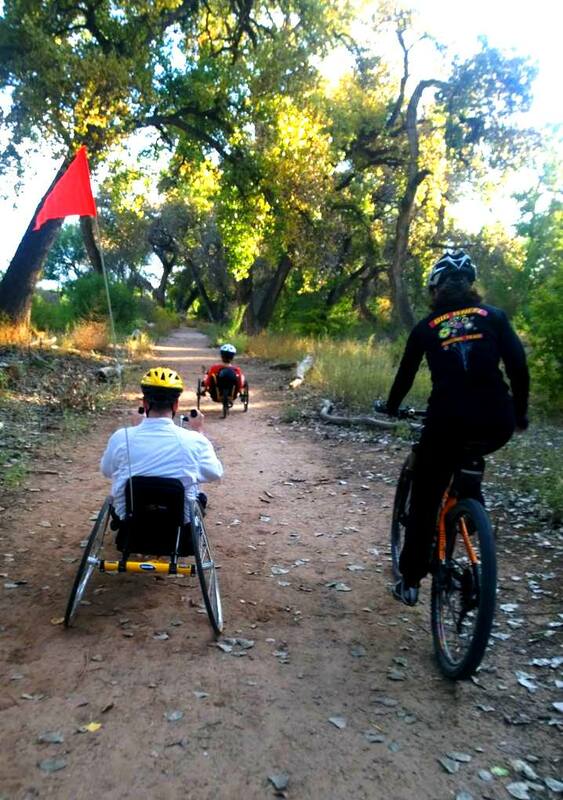 Once again I was able to hit the trails, finding renewed freedom on three wheels. But then this spring my MS went all Screech on me (i.e, extremely annoying, re: Saved by the Bell), pirating my leg strength. 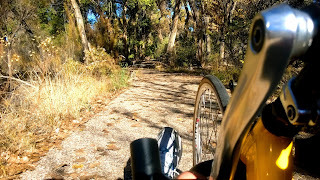 That meant my already short and slow trike rides had to get shorter and slower. When Laura, jogging leisurely, quickly turned into a distant speck while I tried desperately to keep up with her scorching 6 mph pace, I almost cried Uncle. Almost. While my legs bark at me these days when I do anything remotely taxing—like going to the pantry to grab a bag of Cheetos or to answer the front door (Laura wisely put up a sign that reads, KNOCK LOUDLY AND WAIT A FEW MINUTES, seriously)—my arms thankfully are still mostly cooperative. Yeah, they are numb, my right side can get a bit “heavy,” and coordination is not 100%, but they work infinitely better than the two sticks masquerading as functional legs. Why not a handcycle? I discovered last year I couldmotor on one, and I could pass along my newish trike to Laura so we could actually ride together. Now I am not going to deceive or kid myself. Having multiple sclerosis means there will always be this tug-of-war, an unwelcome thief trying to swipe joys and a stubborn SOB (uh, me) who doesn’t want to let them go. I have a simple rule: When multiple sclerosis tries to steal your passions, do everything in your power to steal those passions back. I know I won’t pull that flag onto my side every time, and even when I do, it might take on a wholly new form (a handbike rather than a bike-bike). But I have to try. I always have to try. So this past week I raided my disease’s passion chest, and stole back my passion for riding once again… with a little help from Craigslist (and a good friend with a large minivan). I went farther on my new arm bike than I’ve ridden on any type of cycle in the last six years. And then I did it again two days later. And again today. And I’ll keep doing it again and again as long as I can, sacking as often as possible my multiple sclerosis like the hell-bent marauding plunderer I’ve grown to become. Recovering from HSCT in 2010, the last time I treated my MS.
Grumble, grumble, grumble. No, that’s not my tummy pre-breakfast urging me to consume multiple doughnuts (mmm, doughnuts). It’s just me, grumbling about my MS, which has gotten feisty again. After more than five years of being medication free following my stem cell transplant for my particularly aggressive form of multiple sclerosis, I recently was tasked with choosing my next form of treatment. And boy has the treatment landscape changed since 2010 when I got my HSCT. Back in 1993, the decision of what MS drug to take was moot—Betaseron was our only option. But now it’s like picking out a salad dressing at the grocery store. So many choices! Do I go with the garlic peppercorn ranch with an outside risk of PML or do I try the balsamic vinaigrette that may hose my thyroid? Or do I skip the dressing entirely? Deciding what to do can be so taxing. Here’s how I broke it down, and how I came to a (sorta) satisfying answer. Right now my disease feels like it is in the slow burn stages. Nowhere near the inferno of the fall of 2009, thankfully, but it’s been swiping my mobility like those people who nosh on grapes in the grocery store. Popping one or two grapes isn’t noticeable, but after a while, a bunch is suddenly gone. Am I rolling into secondary progressive? That’s a very real possibility and another piece I had to factor into my decision. For starters, I eliminated treatments I had failed: Copaxone, interferons and Tysabri (and I am JC positive to boot). That part was easy. So was saying no to Novantrone—far too many risks with far too little benefit; doctors are rarely prescribing it these days anyway. Then because of the fuzziness of my MS (no relapses in over five years) I nixed treatments that were generally ineffective in secondary progressive trials, so Gilenya, a powerful RRMS oral drug, was out as was Tecfidera, which also showed inconsistent performance in progressive MS.
What about Lemtrada? It’s a big gun, and a treatment I tried to get on in 2009 as part of a clinical trial, but there would be a few issues with taking it now. It works best in the relapse-remitting phase of the disease, the first infusion in New Mexico just took place last week so the waiting time would be lengthy, and my stem cell transplant took a not so dissimilar path as both are immune system reboots. Also Lemtrada does come with a host of side effects, something I might be more willing to overlook if my MS was raging, but it’s not. Off label options? Rituxan seemed like a logical, no-brainer path, especially after the recent announcement of ocrelizumab’s success in treating the primary progressive form of our disease. Ah, but lack of FDA approval, likely to happen in 2016, means insurance will not cover the medication—despite me asking nicely. I won one big fight in this department, but two? Wasn’t going to happen, especially since I would not be taking the drug as part of a clinical trial. And finally, another stem cell transplant, the biggest gun (and one I have zero regrets using) seemed like too drastic of a step for a treatment that lasted me fewer than five years and one that would cost me personally six figures. 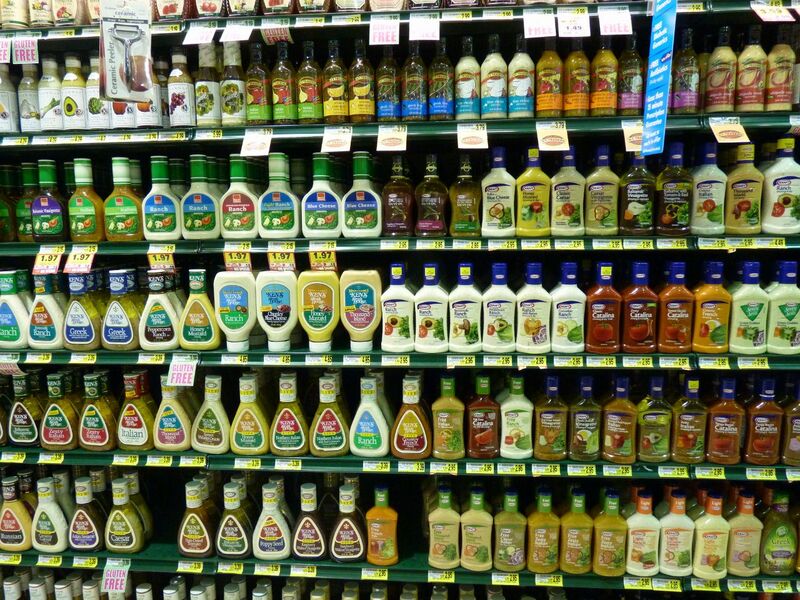 So by process of elimination, that leaves me with one lone salad dressing on the shelf: Aubagio. No, Aubagio might not have the same oomph in preventing relapses as the other orals, but it does have a wild card: it targets both T and B cells. And B cells, as has been shown in ocrelizumab/Rituxan trials, just may be a key part in treating secondary progressive MS. Plus, its side-effect profile is relatively mellow compared to most other DMDs, although you have to have your liver checked regularly. So there you have it. 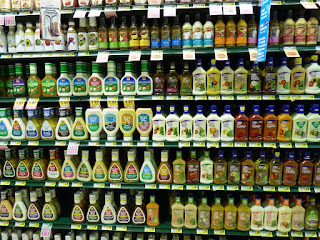 Choosing a salad dressing isn’t easy, but if you stand there and stare at the shelf long enough, one usually stands out. Or you throw your hands up in frustration and just go home and make your own: whisk up three parts oil, one part vinegar, a touch of Dijon mustard, salt and pepper to taste, bam! I’ve never been much of a shopper. Case-in-point, I’ll conjure up the most bizarre combination of foods remaining in the pantry and fridge to avoid going to the grocery store, which drives Laura bonkers. Sure, I can make dinner with carrots, leftover rotisserie chicken, frozen peas, half a lime, fish sauce, and a package of ramen (hmm, sounds kinda tasty). And just as suddenly as I develop my spontaneous menu, my wife is at the grocery store purchasing all these fresh veggies with instructions for me to use them or else. Ah, success once again in sidestepping shopping. But sometimes your hand is forced. Like when your underwear needs replacing. Yeah, I know. Dave, it’s just underwear. You can wear it forever. No one will know how smarmy it is. That’s what I thought, too, until I finally held a pair of my boxers up for inspection and discovered it was basically a rag barely attached to an elastic band. The holes had gotten so big that a warning label was required as the undies were now choking hazards for small children. (“What happened to little Jimmy? Got his head caught in Dave’s boxers—a tragedy. At least they were freshly laundered.”) If I were to put this pair in a piece of luggage and try to fly with it, TSA would confiscate it for immediate incineration. The Smithsonian has been leaving messages to put it on display as an artifact from the 20th century. You get the picture. 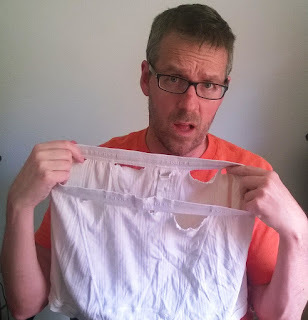 And if you didn’t, I’ve included a pic of said undies. I’m sorry, there are some things you can’t un-see. Okay, shopping was now required. Ugh. 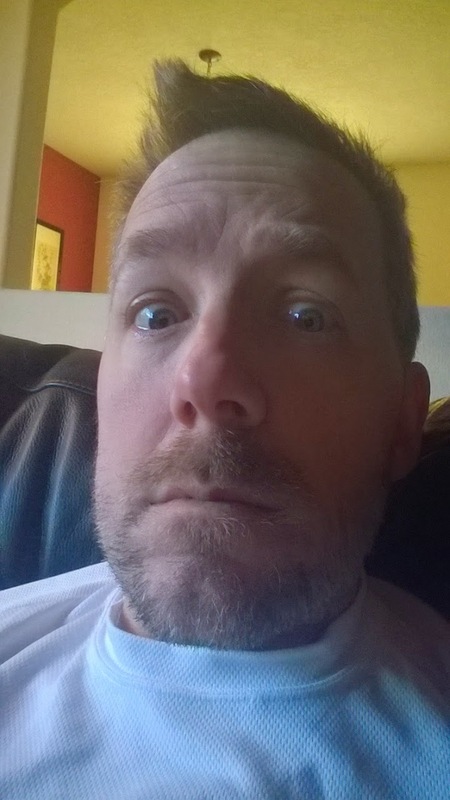 As someone with multiple sclerosis, and being, well, a dude, there are few chores I dread as much as wandering crowded, loud malls teeming with oblivious shoppers who almost appear to go out of their way to run into you in order to look at inexpensive sunglasses and cellphone cases on a cart by the escalator. (Speaking of escalators, tragically a woman recently died in China falling into one and another man lost his leg, yikes.) The cacophony of it all just gets to be too much. Men's underwear circa 15th century. That's damn old. So when I have to clothes shop, I make it count. If I’m forced to be physically present in a store to try on stuff—jeans, shirts, shoes—I’m buying enough to last me a few years. This technique obviously has risks, which explains some of my dated fashion disasters. (I thought, unwisely, that Dockers and pastels were going to last longer than 1986.) But when it comes to clothing that does not need spousal approval, i.e., underwear, I order by the pallet, fashion sense be damned. Now I am awash in so much underwear that I could fill a tub and bathe in Hanes. Our rag drawer is again bursting with newly added cotton dusters, all with a convenient front pouch to grip. And my MS will not thwart shopping trips for years. Because, let’s be honest, I’m not venturing out shopping again until I need new underwear! Believe it or not, my wife Laura is not, I repeat, not a fan of spiders. In particular, large, hairy spiders. So it falls upon me, as the spouse without an aversion to arachnids, to dispatch of said spiders. Fortunately, most eight-leggers taking up residence in our household do not meet this description and I can shoo them away to live another day and feast on our home’s pests. Alas, on the eve of publishing the most recent ActiveMSers newsletter (subscribe here), an LHS--aka, large hairy spider--made its presence known in the kitchen and refused polite requests to scamper. So I was called into duty and immediately holstered a shoe. But there was a problem, actually a few problems. Problemo uno: I have multiple sclerosis. Problemo dos: I have balance issues. And problemo tres, I feel I have duties as a spouse that I want to maintain despite my disabilities and will stubbornly do things I probably shouldn’t do. Like take out the trash, wrangle vacuums, and pull weeds without sitting down. And attempt to kill spiders. On a freshly waxed kitchen floor. In socks. After a beer. Okay, you can already see how this is going to end. BADLY. The good news: the LHS was dispatched. The bad news: in the process of cleaning up the detritus, karma collided with that fleeting sense of accomplishment and despite using my walker “to be safe” I promptly auditioned for America’s Funniest Home Videos sans the video, and, well, the funny. 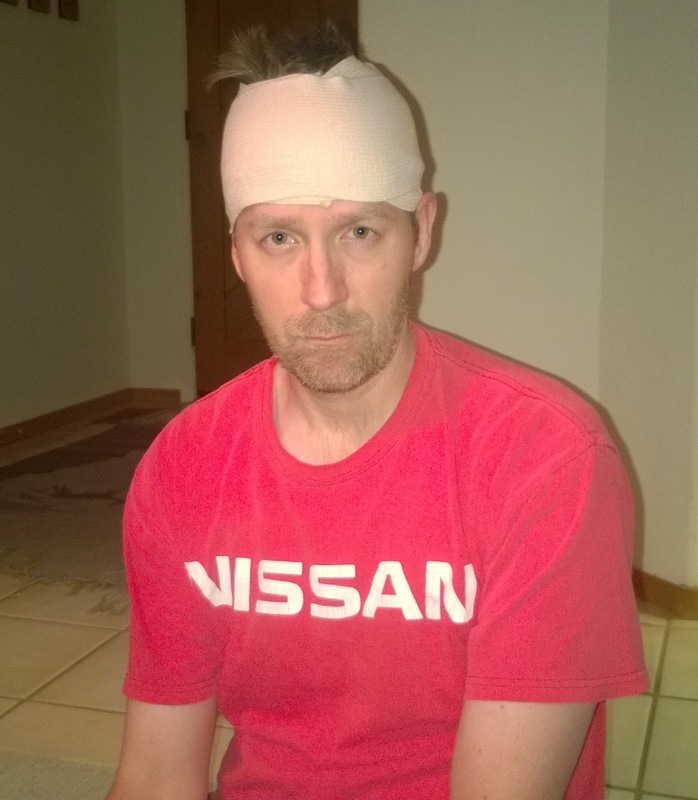 Out went my feet from under me and backward I went, clocking a wall with my noggin on the way down. Fortunately, splayed out on the ice rink, er, kitchen floor, I took a broken bone count and everything was intact. No muscles were torn. Nothing hurt except for that new knot on my wet head. And then it occurred to me that it was mighty strange that my head was wet considering that I had not just taken a shower. Uh oh. A late night ER visit and three fresh staples later (staples! ), not to mention an epic pout face (see above photo), I was as good as new. Well, not new new. When you’ve got a disease like multiple sclerosis that tries to steal long-practiced spousal duties, making peace with giving up some of these duties is paramount. We want to be helpful like we were before. We want to do the same chores we used to do. We want to be productive and efficient and worthwhile. But sometimes MS makes that challenging. Whether it’s cooking dinner or dressing a child for school or balancing the checkbook or getting the nighttime water, cutting back or letting go of some of these tasks is hard and discouraging. Maddening, even. I mean, I want to be the best husband in the world to Laura, to be her knight in shining armor. Instead, realistically I would be rendered stationary wearing anything metal and my most advanced form of weaponry would resemble a New Balance sneaker. The realization that I have to give up some of my expected duties as a husband is enough to make me want to bang my head against the wall in frustration. But, as I unfortunately and painfully discovered, that usually just leads to staples in the head. 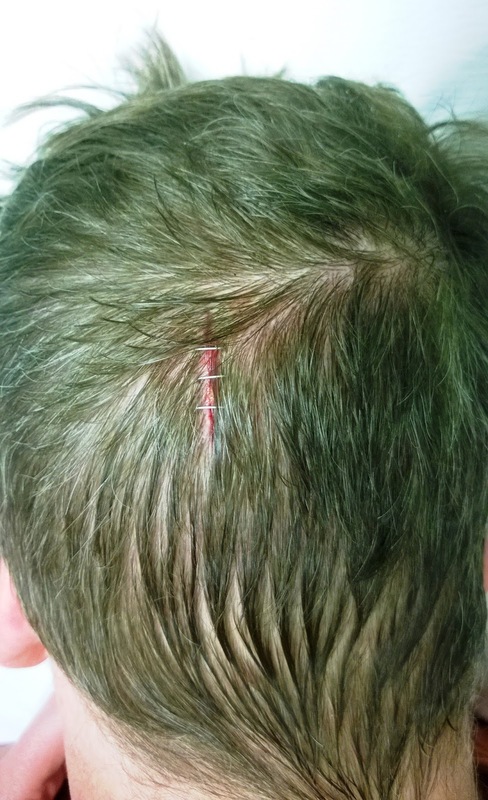 And trust me, you don’t want staples in your head. Besides, it makes getting an MRI rather problematic, you know, with all that metal and all. And I think we can all agree, with multiple sclerosis we have enough problems already! When you’ve got an annoyingly pesky disease like multiple sclerosis, some of life’s pleasures become a touch more complicated to enjoy properly. Take, for instance, the beach. 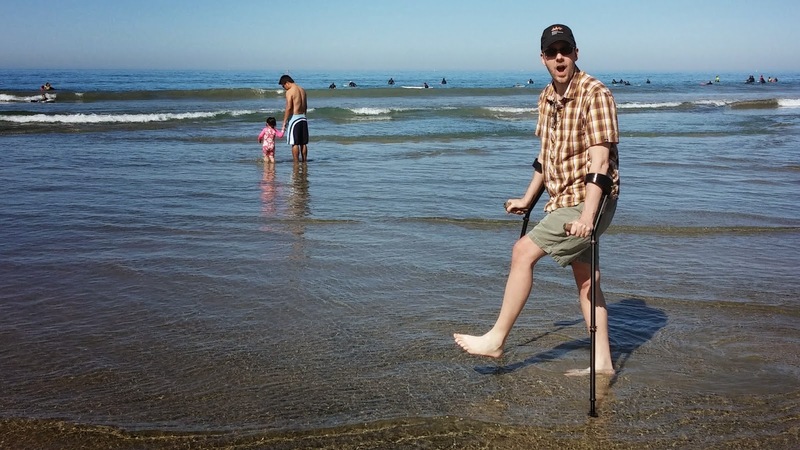 Walking aids like canes and forearm crutches suffer in the deep sand. Wheelchairs and walkers? Verboten. And then there’s the heat—hot days, hot sand, hot sun. Even the water can be paralyzing. Literally, at least for me. If it’s cold and I dip a foot in, my whole body violently convulses. So if I were to wade willy-nilly into the ocean, my last words to Mother Nature would almost certainly be something along the lines of “don’t tase me, bro” before I thrash, collapse and then vanish under the froth of two-foot surf. But there are things one can do to make a beach excursion a bit more enjoyable. For starters, go on a cooler day, or at least go during a cooler part of the day (mornings are good). Always tote shade. Icy drinks and a cooling vest are standard weapons. If you use walking aids like forearm crutches, trekking poles and canes, tips that can handle sand are quite helpful. 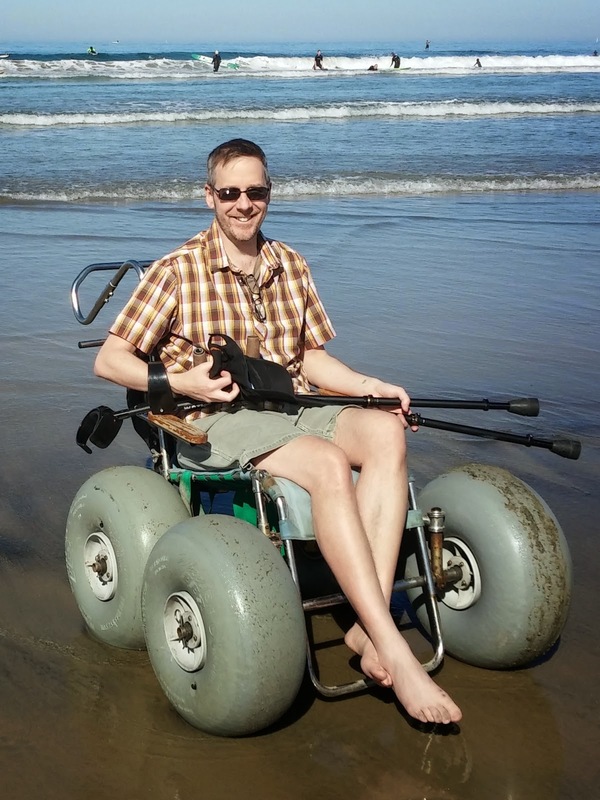 And coolest of all, borrow a beach-friendly wheelchair. Yes, they exist. Lifeguard stations at popular beaches may have one or two, just ask. 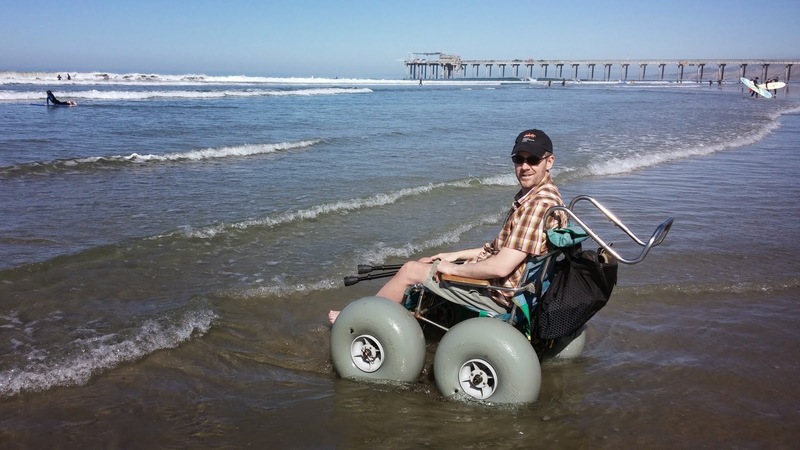 That’s what I did on a recent San Diego trip and was surprised to find that the city’s best beaches had both manual chairs (you need a pusher) and motorized chairs available on a first-come, first-served basis. I’ll be honest, it was the most fun I’ve had on the beach—and in the ocean—in years and years, way before I even had MS. It took me back to my childhood when I would spend entire summers at the community pool. I was that tanned kid with a big smile and bleached, sandy white hair, the one who rode his 3-speed banana-seat bike in his bare feet anywhere and everywhere. I was free. 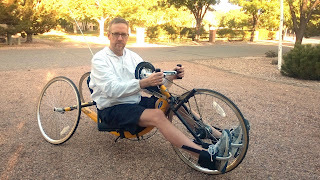 While my beach wheelchair might have lacked a banana seat, I was a kid again. And I was free again. It was bound to happen at some point. You don’t prepare for it—you never do. But when my wife Laura was told the newly discovered lump in her breast was growing quickly and needed to be removed immediately, our roles as patient and caregiver were violently upended. Funny, I recently was featured on WebMD talking about, of all things, the importance of caregivers. Now, without warning, I was forced to become one. Gulp. Breast cancer runs in Laura’s family. Her grandmother was diagnosed with it in her 40s. Her wonderful mother tragically passed away from it at the age of 66. This was no joke. And that was a problem. As I mentally cataloged all of my potential skills as a caregiver, which took all of a few seconds, I concluded that my greatest caregiving asset was… humor. Jeezo. Fortunately I discovered my caregiving skillset was deeper than I anticipated. Maybe not so much in the physical sense—other than rewrapping her dressings and getting the occasional glass of water—but I could support her in so many other ways. And yes, I did manage to make her smile without getting into too much trouble, although getting her to agree to be photographed prior to surgery was a bit of a stretch. How did it all go? Swimmingly. My biggest challenge as caregiver was making sure I didn’t fall onto her needle-prepped chest kissing her good luck before the surgery. From there things just got easier. Her recovery was swift and she was a perfect patient. Ah, but of course—she must have learned from the best! Please note that previous sentence drips of sarcasm. And the tumor? Benign. It feels so good to breathe again. If you’ve ever had walking issues due to multiple sclerosis, you are bound to have experience in the sport of surfing, specifically furniture/wall/appliance surfing. One engages in said sport by eschewing practical walking aids—a cane, a walker, forearm crutches, etc.—in favor ricocheting off of solid objects in one’s home. Here’s how it works. Say you decide you want another beer … yet you find yourself sitting on the couch eating Cheetos while cursing your wonky legs. “I hate you, wonky legs,” you mutter (with or without expletives). Then for reasons unknown, you opt to step over your cane—conveniently resting aside the couch—to channel legendary surfer Kelly Slater. Off to the kitchen you go! Couch armrest to end table to wingback chair to family room wall to fireplace mantle to dining room wall to dining room chair to dining room table to kitchen wall to pantry doorknob to countertop to sink (nice hand holds!) back to countertop, and then finally to refrigerator handles. Cowabunga! You just rode that barrel and exited the green room unscathed! Now simply open the fridge, get your beer, and resurf your steps, which is cake since there is now a fresh smear of Cheeto orange all over your house. But, as veterans know, shooting the tube can be gnarly if surfing is not done smartly and safely. 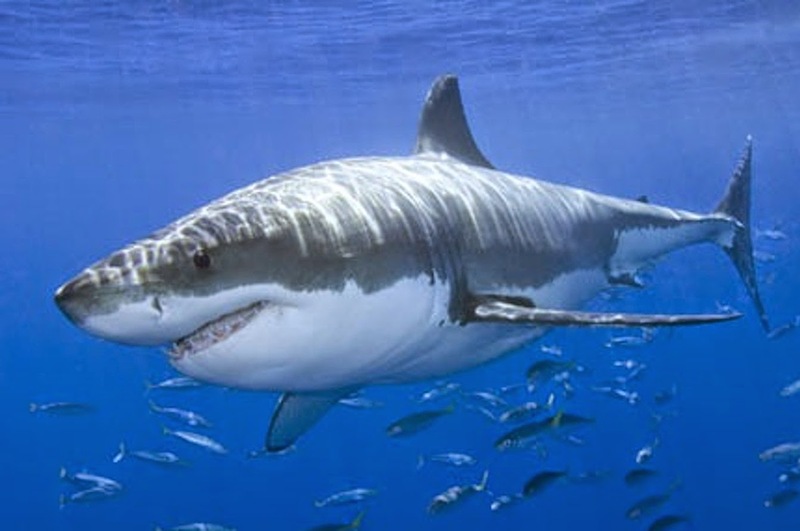 To avoid being a Barney, aka a lame surfer, you have to keep your eyes peeled for potential perils, like men in gray suits—in other words: sharks. House sharks are things you should not grab for support. Floor lamps. Recliners that rock. Christmas trees. Lightweight tri-fold Shoji screen room dividers made primarily of paper. The horns of poorly mounted faux animal heads. Yes, the list of “sharks” is practically endless. Alas I discovered after a recent mishap, there also are degrees of Barneyism, from mildly dorky to full-on moron. 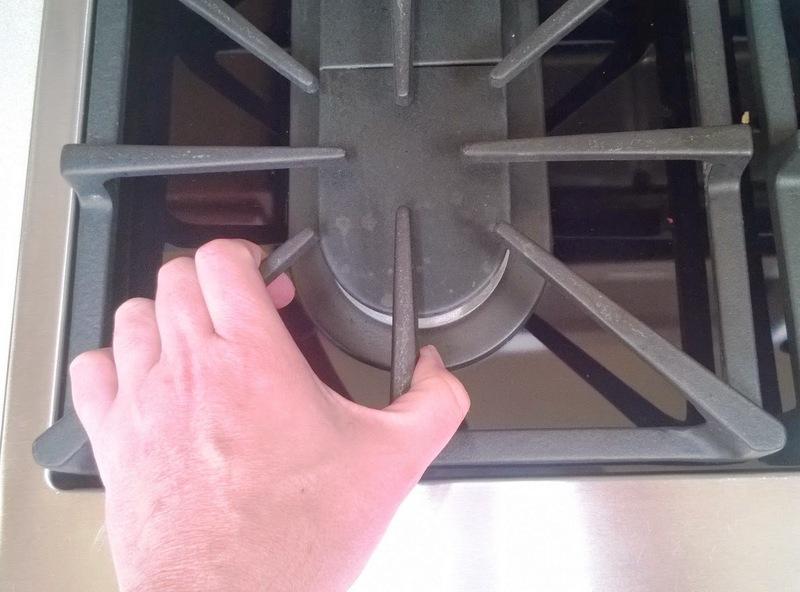 For example, after you cook a slab of bacon and move the hot pan off the even hotter stove, DO NOT UNDER ANY CIRCUMSTANCES then use the convenient cast iron grate of said hot stove for support. This dawned on me as rather obvious while I was running my left hand under cold water for 15 minutes as Laura fetched my cane while trying not to injure her neck due to repeatedly shaking her head in exasperation. Yes, even though I typically avoid furniture surfing (and even warn against it due to potential mishaps), I went full Barney. No, I’m not proud of singeing my palm or freaking out my wife. But it could have been worse. I could have pulled a Barney while hanging eleven (uh, Google at your own risk). The lesson here: wade carefully into such waters and always use your walking aids. Or just blindly ignore my advice. Surf’s up! When you use walking aids—and are under the age of 70—you are going to get questions. It doesn't matter if you are using a cane, trekking poles, forearms crutches, walker, or pogo stick (not recommended, by the way). People are curious and have an unquenchable desire to eat one's own foot. This is particularly true when using said walking aids in an unfamiliar way, say trekking poles—with rubber tips—away from the trail. Even I'll admit it does look a bit strange to be walking around Costco with gear more suited to scale Kilimanjaro (although granted the store is large enough to nearly qualify as a leg on the Appalachian Trail if one walks the entire length of each aisle). Of course you expect to get the occasional quizzical look or two. Perhaps the head-snapping double-take. Maybe a question about your disability or a misguided "get well soon." But the snarky, “I don’t see any snow” comments sort of piss me off. Not enough to make me want to clunk these jerks in the head with my Black Diamonds, but enough for me to stew about it. Alas, I always just smirk and nod, but it is cathartic coming up with snappy returns that will forever stay in my back pocket. Probably. Portions originally published June 26, 2008. Edited and expanded.